Ah, the covers album. A lot of folks’ eyes go into emoji mode at the very mention of the genre. The perception is that artists go there for two reasons – either they fresh out of ideas and they’re trying to create some buzz by consulting the Motown, Stax or (and) the Great American Songbook canon, or an artist might be at the top of his or her game and covering the songs that they grew up loving or perhaps even inspired them to become a singer is a labor of love. Maysa Leak, based on the quality of her solo work, her status as Incognito’s best known and loved vocalist, and her reputation as a much in demand duet partner, plants her firmly in the latter category. Maysa could probably lend her distinctive dusky alto to melodic renditions of the Yellow Pages and still land a Readers’ Choice Award. That leads us to another pitfall that often consigns a cover album to plainness – going to the “My Girl,” “I Wanna Hold Your Hand” well once too often, or perhaps playing it a bit too straight. While Maysa gives straightforward renditions on several tracks, she is not playing it safe here. Taking on one of the better 1980s era rock songs by Pat Benetar, “Love Is A Battlefield,” and transforming it from a hard charging rock song into an acoustic soul ballad certainly qualifies as imaginative. In addition to the inclusion of “Love Is a Battlefield,” Maysa showcases a willingness to reach into R&B’s past for two tunes where the originals are rarely heard on the radio: Odyssey’s “Inside Out” and “Mr. Dream Merchant” by New Birth (and before that, Jerry Butler). The latter tune is one of the album’s highlights, as Maysa’s luscious vocals melt around that tracks decidedly 70s analog arrangement. 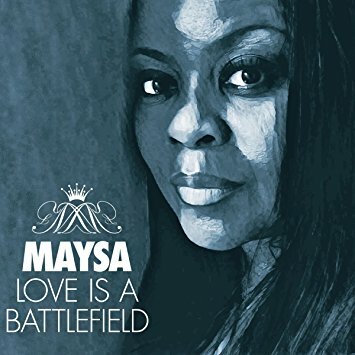 On Love Is a Battlefield, Maysa chooses the appropriate songs on which to venture out of the covers safety zone, and the right tracks to play it straight. Of course, the voice remains the constant, as it has been since Maysa Leak emerged on the scene, first as a backing vocalist, then as the largest star in Incognito’s vocal firmament, and finally one of the most respected voices in soul music. With that combination, this is a thoughtful album of familiar songs that simply stands out. Recommended.